1950s inspired pastel mauve pearl and crystal hair pins which will add elegance and sophistication to a feminine updo. 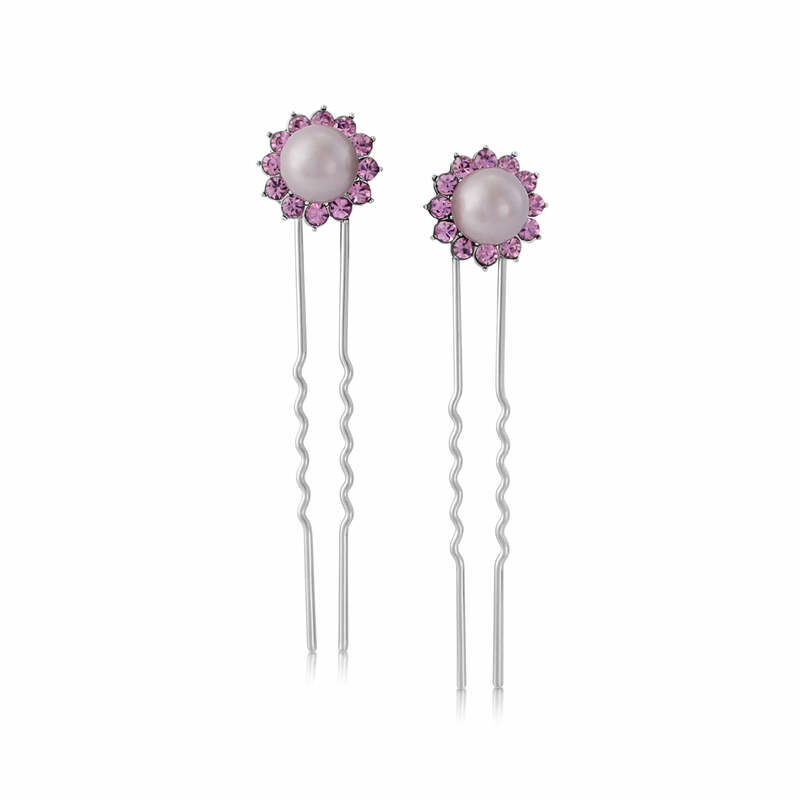 A dream of misty mauve hues, our Haze of Amethyst Hair Pins capture a style that is romantic and feminine. A muted tone of lavender pearl is encased by shimmering amethyst crystals to create a design that is simple and elegant to allow the divine colours to shine. Set on a double silver tone prong pin, this pretty pair will add a touch of charm to a chic updo and for a more dramatic look, several pairs randomly scattered throughout your hairstyle looks nothing short of striking. If you’re looking for the perfect lilac bridesmaid hair pins, Haze of Amethyst will adorn your bridal party’s hair with sumptuous accents of colour. With more than a hint of 1950s retro style, play up their vintage influences by coordinating with full skirt prom dresses or cute floral prints and a girly ponytail. For contemporary and sophisticated wedding day style to complement classic lilac or purple bridesmaid dresses, a chic sleek chignon is the perfect hairstyle to showcase these dainty hair accessories to perfection.